Today’s in Kitchen…….Kerala’s Traditional Dessert..
Who doesn’t like Payasam and that too Gothambu (wheat) payasam?? Its one of the favorites of all. 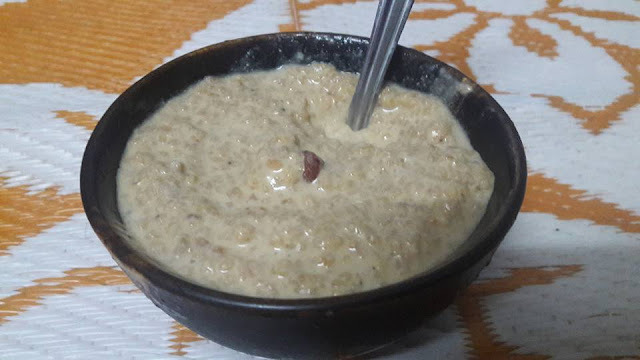 Gothambu or Wheat Payasam is another favorite dessert in Kerala served after a lunch during festivals such as Vishu and Onam. and is made with broken wheat. Poor Photography but taste was wonderful…..
Coconut slices – 25 to 30 nos. First of all, take a cooker, put the broken wheat into it and wash it thoroughly. Then add 4 glasses of water into the washed broken wheat and cook for 3-4 whistles in high flame and 2 in low flame. The wheat needs to be cooked well. If it doesn’t get cooked we as shown in the pic, cook it again. This is because once you put anything uncooked into jaggrey , it will not get cooked after that. It will remain as it is. Remove the skin of the cardamom and crush the seeds well. Add a pinch of sugar while preparing a powder of cardamom seeds. This makes it easy. Keep the cardamom seeds powder aside. Step 1 – Take the grated coconut and grind it in the mixie. DO NOT MIX WATER. Take the ground coconut and squeeze it with your hands to extract the milk out of it. This is called the 1st coconut milk. You will get approx. 300 ml of this. Keep it aside. Step 2 – Once the first milk is extracted, add around 100 ml of water into the ground coconut and grind it again in the mixie. Now take the ground coconut and squeeze it with your hands again to extract milk. This is the 2nd milk and this will be dilute compared to the 1st milk. Step 3 – Once the second milk is extracted, add around 200ml of water into the ground coconut and grind it thoroughly in the mixie. Now take the ground coconut and squeeze it with your hands again to extract milk. This is the 3rd milk and this will be dilute compared to the 2nd milk. Take a reasonably big pan (around 3-4 litres capacity) or Uruli. Put the chopped/grated Jaggery into it and allow it to melt. Add 50 ml of water if required. Now, cook the Jaggery until it turns slightly thick and turns dark brownish. While cooking, keep stirring it in such a way that it doesn’t stick to the bottom of the pan so as to avoid it getting burnt. Cook in low flame. In order to identify whether the Jaggery is cooked, check if it flows like honey. The moment it start flowing like honey, it has got cooked. Next add the 3rd coconut milk into the cooked Jaggery and mix well. Bring to a boil and add the cooked broken wheat and the sliced bananas. Cook about for 15 minutes in low flame stirring continuously until the mix turns thick. Check if the banana slices have got cooked. Once the banana slices are cooked and the whole mixture turns thick, add the 2nd milk into it and stir continuously. This needs to be done till the mix boils and gains consistency. Always cook in low flame. Now, switch off the flame and add the 1st coconut milk. Add the cardamom powder. Stir continuously so that a layer does not get formed on top. Take a small frying pan and pour 1 tbsp of ghee (clarrified butter )into it. Add coconut slices and fry until it turns golden brown. Next add the cashew nuts and sauté till the cashew nuts also turns brownish. Next add the raisins and sauté till they enlarge and become like grapes. Add these into the Gothambu Payasam.